What happens when a fast-growing social web recruiting platform gets accurate marketing and sales data analytics inside Salesforce®? Promotions are awarded for the marketing superheroes who made it happen! Moreover, Jobvite had to find a way to gauge deal velocity, understand which campaigns were returning the greatest ROI, and estimate the timeframe to sales impact. Jobvite also needed a way to analyze its marketing and sales funnel data across a number of unique dimensions—by campaign, acquisition channel, and industry segment. But, the company was hampered by lack of a single source of data. Like many companies, Jobvite’s data was stored in multiple silos—marketing information was in Marketo and Salesforce, customer service data was in spreadsheets, and the company’s product information resided in a proprietary database. The team had to find a way to consolidate data into a single source of truth. That required infrastructure and expertise to connect the dots. 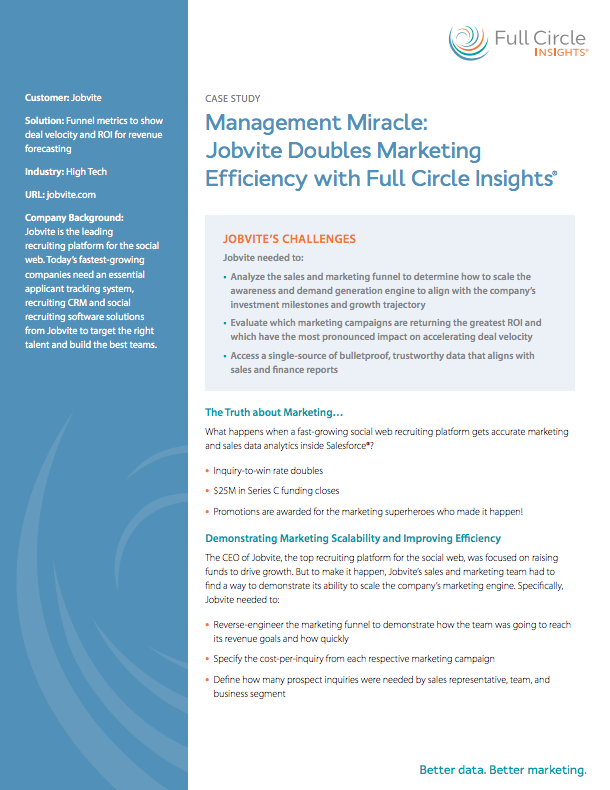 Jobvite implemented Full Circle Response Management to provide a single source of truth— consolidating marketing and sales data inside Salesforce. Response Management is a robust marketing performance management solution that extends reporting functionality, accuracy, and visibility into all marketing data within the Salesforce1™ platform. By using Full Circle Insights, Jobvite was able to analyze its sales and marketing funnels by source, team, and sales stage—accurately attributing revenue and pinpointing where buyers were in the sales cycle. They were also able to accurately calculate funnel stage conversions and deal velocity to build individual funnels at the sales representative level so salespeople could track their own progress during each quarter and identify deal leak points. Because the new approach delivered such amazing results, Jobvite management rewarded Matt Singer, VP of Marketing, and Ronen Shetelboim, Director of Marketing, with promotions. And, the collective work by the Jobvite and Full Circle teams was more broadly recognized when the company closed a Series C funding of $25M, enabling Jobvite to continue its ambitious growth plan as the dominant player in the social web recruiting space. Download the Jobvite case study below.